The construction material for general construction which includes stones, pebbles, sand, cement, etc. are obtained from sources i.e. mountains, riverbeds and rocky terrains. Special equipment which can be transferred with minimum efforts is thus required for processing the materials which involves crushing into smaller parts and screening i.e. segregating different components of material from the mixture. Highly stable mobile crushing and screening equipment have been requirement of various industries. The market for Mobile Crusher and Screener is estimated to be $ 1.49 billion in 2017 and is expected to grow at a compound rate of around 5.57% for the period 2018-2023. The Asia-Pacific region is projected to register a growth of around 8.5% and European region is estimated register CAGR of less than 1%, reasons being discussed in the report. The market size for all regions is estimated and forecast for the period 2018-2023. The shift of preference of quarry operators from setting of a stationary plant to employing mobile crusher and screeners can be prominently seen in most of the geographical regions with Asia-Pacific regions adapting very quickly to the mobile technology because of high transport costs. What are Mobile Crushers and Screeners Equipment? The mobile crusher and screener equipment are the machinery used for crushing and processing stones and minerals basically stationary crushing and screening equipment are mounted on a mobile wheeled or tracked platform. The mobile equipment are transported to the work site where they can maneuver within the site to crush and screen the aggregate. Mobile equipment performs the task of primary crushing of drilled or blasted stone or mineral ore at quarry or mine location, they can also perform secondary and tertiary crushing at the work location producing finished product. The time and cost of transporting the stone or mineral ore to the stationary mobile crushing plant and further to the location where it has to be used is significantly reduced by the implementation of portable crusher and screening plants. What are the major applications for Mobile Crushers and Screeners Equipment? The major applications of the mobile equipment includes primary on-site crushing and screening at Stone Quarry, Mineral mining sites, Construction sites and Recycling of waste demolished concrete and other material. The mobile equipment has life of about 8 years to 10 years which leads to resale of the equipment, thus old and new mobile equipment are available in the market. But with the changing technology features, capacity and reduced energy requirements has further boosted their use along with the growing infrastructure construction and modification across the world. They are further used in landscaping a particular site according to the requirement of the builders. The crushing and screening machinery need to be reliable around the year, including winter time and also the crushing sites are usually located in quite remote areas. Even if the machinery is very durable and reliable, every now and then it needs maintenance and spare parts. Dust-and noise pollution are prevalent at the crushing sites and the distance between different sites can be very long and it causes challenges to the maintenance services. The screen and crusher machine manufacturers are putting efforts to make sure that maintenance and spare parts are available. The Finnish stone crushing industry is the market leader in Finland and has built a strong image for itself. It values the domestic products mostly because of better availability of spare parts and maintenance services. The other valued aspects regarding the machinery are more general issues like reliability, durability, efficiency, mobility, and production capacity. There is a market niche within the Finnish stone crusher and screener market. There is a spot for competition available in the market in Finland. Rubble Master has come with latest innovations the result of 25 years of experience, the RM 120GO mobile crusher. The RM 120GO has led it into a new era and it paves the way for the future of RM. RM 120GO weighs 35tonnes and has a capacity of up to 350tonnes/hour. The flexible range of use of the mobile RM crusher in both recycling and the processing of natural stone was one of the main goals in its development. RM crushers and screens process a wide variety of materials with a vast range of requirements and purposes. Companies operating with crushing and screening machines have at least one of their crushers old since it harder to get spare parts for newer machines. Newer crushers are not as durable as older parts are more likely to have a malfunction with newer machinery. Hence the older machinery is more durable and preferable in structural level, but when it comes to electrical issues, the newer models are not as sensitive to failures as the older ones. Thus the new players need to consider compatibility options. 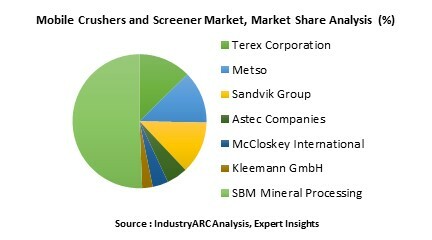 Who are the Major Players in Mobile Crushers and Screeners Equipment market? The players profiled in the report include Sandvik A.B., Metso, Terex Corporation, Astec Companies, McCloskey International,Blue Group, DUO (Europe) plc, Maximus Crushing and Screening Ltd (NI), Quarry Manufacturing & Supplies Ltd (QMS), Sandvik Mining and Rock Technology, A&I Psomiadis OE, Aasvogel Recycling.